When a business opens, it takes only a short period of time before its real-world presence is reflected in the online world. Services like Google Maps and Bing Maps are actively updated in a constant struggle to remain current. Google has spent years (detailed in a new video released today) building incredible technology to keep maps innovative, useful, and up-to-date. As a result of this, when a business closes, there’s a huge incentive to remove any traces from the online repository of places, to keep everything current. But worry not. Beginning today on Pastmapper, listings like these, for any business, can have their own dedicated page where details can be gathered and shared. The history of a coffee shop that closed several years ago is a mundane topic for most people. But if that coffee shop was in your neighborhood, or was the scene of an event important to you, then to you, it’s highly relevant. Even if you don’t know exactly what you’re looking for, you can build a valuable understanding of what a neighborhood was like at a certain point in history by browsing through business listings to take a walk through the streets of the past. Whether you browse Pastmapper through the map or start by searching for a particular business name or building address, you can now explore the past more easily and with a greater level of detail than ever before. 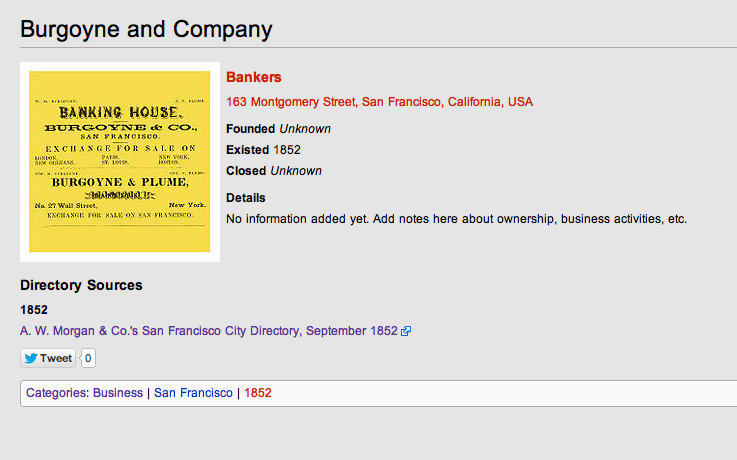 For today’s launch, the listings from the 1852 San Francisco city directory are all here. 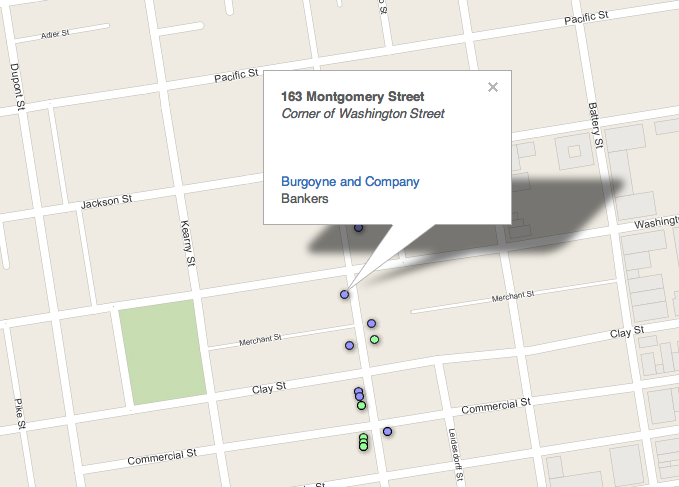 As before, you can click through the 1853 map and find a business or person. Now you can click on that person or business and learn more. Now you can see even more data about Brooks and Luken or Burgoyne and Company, businesses that existed in 1852 that are now long gone. If you have more information (perhaps for a famous place like the Oriental Hotel, then please register for an account and add it. 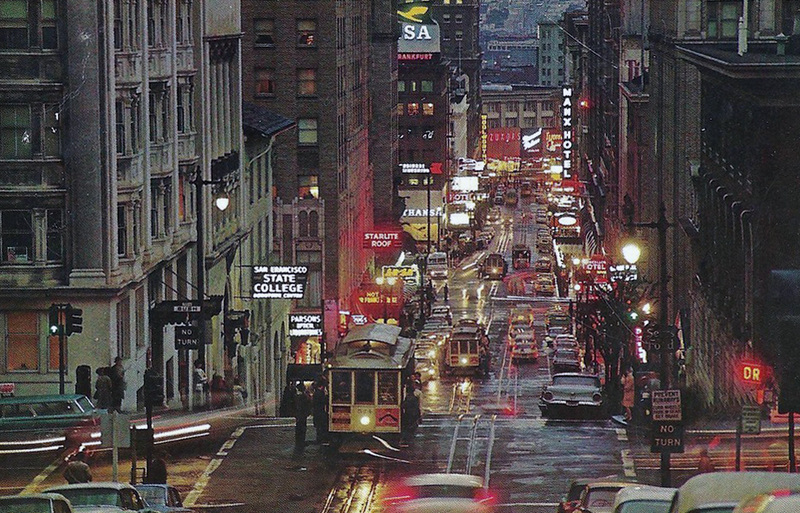 But now, in addition to the 1852 listings there’s also a few thousand new ones; the complete listings for San Francisco restaurants and bars from the year 1966 are all here for your persual. You can browse the map and click through for additional detail about the listing, including ownership, years of operation, and photos, if available. Also strangely notable for 1966 is the preponderance of the word grotto. The word isn’t as common today, but it seems that if you were a restaurateur trying to create an alluring je ne sais quoi for your establishment in the earlier part of the 20th century, you slapped the word ‘grotto’ on the name. 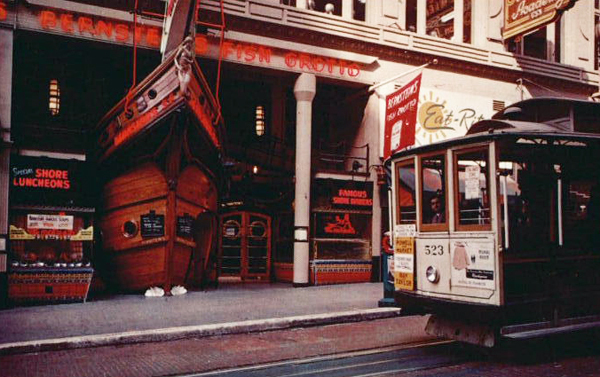 Hence, we have not only the famous Bernstein’s Fish Grotto (shown above), but also Ernie’s Neptune Fish Grotto, Joe’s Fish Grotto, Miramar Fish Grotto, Lighthouse Seafood Grotto, Pompei’s Grotto, Fishermen’s Grotto, and my personal favorite, Johnson’s Tamale Grotto, an institution closed now for almost 40 years, whose famous tamale gravy recipe has now been published online. Listings for additional years will be added soon. Take a look, and stay tuned for more! 1 Pings/Trackbacks for "A Page for Every Place and Time"